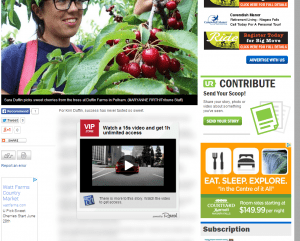 Ever wonder about how to Remove the Annoying VIP Zone Video from the Niagara Falls Review’s website? I absolutely love following local news, but I really can’t stand being forced to pretend I’m going to watch a video. After a couple of days of clicking to watch the video, I got sick of clicking the watch video link. I looked at the HTML for about ten minutes and decided it would be pretty easy to hide the box and show the content again. Go to the Niagara Falls Review’s website and open up the desired article.